It is good to be home. Despite an enjoyable holiday filled with cultural and gastronomical adventures, I will always be a homebody at heart. 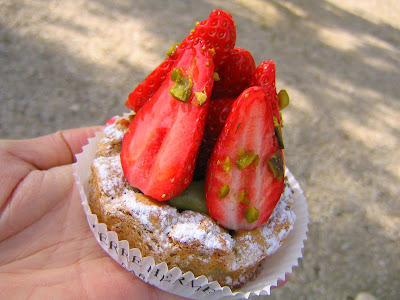 Our travels took us from Nice, through Arles and to many smaller towns in Provence by car, up to Montelimar and Lyon, onto Amboise in the Loire Valley, and finally to Paris - where the vast majority of caloric intake began. The list which I assembled (on spreadsheet of course, with accompanying GoogleMap for each location) included approximately forty pâtisseries/chocolateries/boulangeries and in the 4.5 days in Paris, we managed to visit twenty-six. Visit did not always mean purchasing or eating; in fact, I discovered that Eric gets physically ill after eating too many sweets and had to resist buying more pastries in order to prevent turning him off pastry forever. With so many choices and such great variety of sweets, it was hard to decide what to taste and which were favourites. The complexity and quality at Pierre Hermé made his creations my absolute favourite. 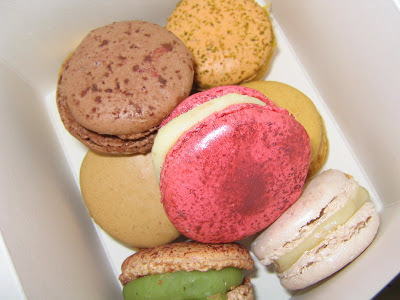 The macarons were unbelievable, in texture, complexity of flavor and eye appeal. At almost 2€ per mini-macaron, they better be that good. For more photos of our trip, including non-gastronomical sites, some stealthily taken shots of pastry shop interiors, and many course-by-course dinner photos, please click here. Of course, I can not forget to mention other culinary highlights of our trip including a fine lunch at a small bistro L'Epicerie in Avignon, an unbelievably good concept restaurant/wine cave Les Papilles in the 5th arrondissement, and our exciting venture into Michelin starred restaurants Le Gourmet de Sèze in Lyon and Hélène Darroze in Paris. Our VISA card is still recovering from the latter. Returning home has also meant embarking on my Pan Pacific practicum. The environment is very different - bigger, busier, male-dominated, more hierarchical, and more personalities to learn to interact with. I knew that the inevitable question "what did you do before pastry?" would be asked by every new person I met and that every response would be a version of "are you crazy?". My answer is still very awkward as I find it very difficult to translate my feelings about ophthalmology to anyone who has not been in clinical medicine. One person, after hearing my reasons, stated that there is no such thing as the perfect job. I certainly do realize this fact; however, to remain in an unhappy situation just to please everyone but yourself is also not a healthy choice. I am just grateful that I do have the opportunity to take this time to explore a new path and undoubtedly, I would have deep regret in life if I never did. Posted by Charmaine at 7:19 p.m. Welcome back! Everything looks so yummy - makes me want to go again! Good luck at the Pan Pacific. April 12, 2007 at 8:42 a.m.